When the Adaptive Cruise Control (ACC) is switched on, the green indicator lamp in the instrument cluster lights up, and the speed memory and the status of the Adaptive Cruise Control are shown in the display . The selector lever must be in position D or S or be in the Tiptronic gate. A forward gear, but not 1st gear, must be selected in the manual gearbox. In vehicles with a manual gearbox, the actual speed should be minimum 30 km/h (18 mph) if no speed is stored. When switched on, the speed can be stored and set. The stored speed can vary from the speed actually being driven if the distance is being actively controlled. Switching on the ACC. Press the button on the multifunction steering wheel. The system is switched on. No speed has yet been stored and the speed is not yet being controlled. Switching between the ACC and the speed limiter. Press the button on the multifunction steering wheel. This switches between the CCS and the speed limiter . Activating the ACC. Press the button on the multifunction steering wheel. Current speed is stored and controlled. Press briefly: reduce speed by 1 km/h (1 mph) and store. Press and hold: the stored speed is reduced continuously in steps of 1 km/h (1 mph) for as long as the button is pressed. A reduction in speed is achieved by accelerator release or automatic braking. Switching off ACC temporarily. Press the button on the multifunction steering wheel. OR: depress the brake pedal. OR: depress the clutch pedal for longer than 30 seconds. Control is switched off temporarily. The speed is stored in the memory. Resuming ACC control. Press the button on the multifunction steering wheel. The stored speed is reactivated and controlled. If no speed has been stored yet, the ACC records and controls the actual speed. Press briefly: increase speed by 1 km/h (1 mph) and store. Press and hold: the stored speed is increased continuously in steps of 1 km/h (1 mph) for as long as the button is pressed. Accelerating (during ACC control). Press the button on the multifunction steering wheel. Press briefly: increase speed in increments of 10 km/h (5 mph) and store. Press and hold: the stored speed will be increased in steps of 10 km/h (5 mph) for as long as the button is pressed. Decelerating (during ACC control). Press the button on the multifunction steering wheel. Press briefly: reduce speed in increments of 10 km/h (5 mph) and store. Press and hold: the stored speed will be reduced in steps of 10 km/h (5 mph) for as long as the button is pressed. A reduction in speed is achieved by accelerator release or automatic braking. Switching off the ACC. Press the button on the multifunction steering wheel. The system is switched off. The stored speed will be deleted. The mph figures given in brackets in the table relate exclusively to instrument clusters with mile readings. If the ACC ready for start driver message is displayed in the instrument cluster and the vehicle ahead starts to move, the vehicle will also pull away. ACC ready for start can be reactivated or extended by pressing the button . It is displayed for approximately 3 seconds. If ACC ready for start is no longer displayed, the vehicle will not start automatically, e.g. with active start/stop system. If the vehicle ahead has already moved on, you can pull off by pressing the button or by depressing the accelerator briefly. The ACC then continues regulating. Automatic pulling away is not available for all vehicles and countries. The speed-dependent distance from the vehicle in front can be set to one of 5 levels in the infotainment system . In wet road conditions, you should always set a larger distance than when driving in dry road conditions. 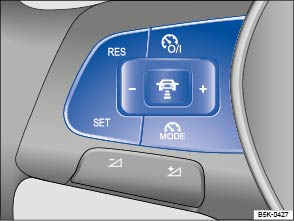 The distance level to the vehicle ahead is set using the button on the multifunction steering wheel . The ACC display appears when the button is pressed . To set the distance level, press the button. When the highest level is reached, the distance returns to the lowest level when the button is pressed again. The distance level can also be set using the or buttons on the multifunction steering wheel immediately after the button on the multifunction steering wheel has been pressed. The button and the and Driver assistance function buttons in the infotainment system can be used to set the distance level that should be selected when the ACC is switched on . In vehicles with Driving Mode Selection, the selected driving mode (Driving Mode Selection) can affect the acceleration response . In vehicles without Driving Mode Selection, the acceleration response can be affected by the driving mode selected by pressing the button and the and Driver assistance function buttons in the infotainment system . If the accelerator is depressed. If no gear is selected. If the ESC is taking corrective action. If the driver has not fastened seat belt. If there is a fault in several brake lights on the vehicle or on a trailer with an electrical connection to the vehicle. If the vehicle is reversing. If the vehicle is travelling faster than approximately 160 km/h (100 mph). If you do not maintain the minimum distance to a vehicle in front and the difference in speed between the two vehicles is so great that the braking action of the ACC is insufficient, you are in danger of colliding with the vehicle in front. You should reduce the vehicle speed immediately with the foot brake. The ACC may not be able to recognise all driving situations correctly. Leaving your foot on the accelerator will mean that the ACC will not brake automatically. This is because manual acceleration overrides the system. You should always be prepared to brake the vehicle yourself. Observe country-specific regulations regarding the minimum distance. The set speed will be deleted if the ignition or the ACC is switched off. The ACC is automatically deactivated when the traction control system (TCS) is deactivated. In vehicles with a start/stop system, the engine is switched off automatically during the stationary phase of ACC and is then restarted for moving off.